It is ideal for customers in Biotech, Pharma QC, R&D, Chemical QC entry-level regulated areas that want more security than Quintix (but do not want Cubis). It is ideal for customers with general weighing applications including Government Lab, food and beverage QC and academic areas. Sartobind® membrane technology allows you to shift from slow and oversized expensive columns to small, single-use capsules. These membrane absorbers are ready to use and save you a lot of time: Switch to single-use chromatography and you'll be able to eliminate packing, cleaning and revalidation steps. Microsart® Geneprep, the perfect solution for everybody that longs for most reliable, fast and convenient contamination control. 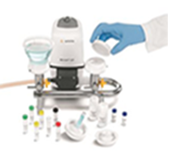 This kit covers filtration devices for sample concentration and DNA extraction in high volume liquids. It is an annual prize geared towards researchers focused on basic or translational research that advances regenerative medicine and cell therapy. The prize is awarded for outstanding research performed by the applicant to raise awareness and significance for our future.